Downtown lighting discussions have traditionally been focused on function and led by technicians concerned primarily with illuminating the public realm to safe standards. Understandably, to be a successful and sustainable downtown, the after-dark hours image of your spaces is one of the most important views in your control. However, today, the lighting discussion is increasingly more about form in addition to strict function. Continued advances in LED technology have led to some amazing lighting displays in major cities, whether it’s the Golden Gate Bridge in San Francisco, the entry sign at the Cosmopolitan on the Vegas Strip, or the industrial landscape of Buffalo’s water front. But you don’t have to go to those communities to realize the value of lighting on the sense of place for your town. Ardmore uses a very simple lighting detail to set it apart from the other first ring suburban communities around Philadelphia. Ardmore has a very traditional pendant style street light throughout their commercial district that lights the public realm, which is by itself not distinct. What makes the community come alive is the ornate letter A that adorns each downtown light post, is constructed of twinkle lights, and is highly visible both during the day and night. 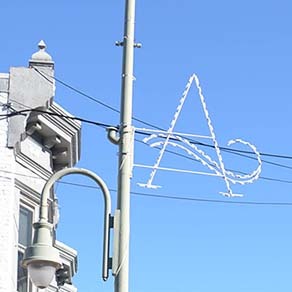 Where other communities add a snowflake or bow at the holidays, Ardmore has used lighting accents to build their brand and create an impressive after-hours experience in their community, every day (and night) of the year. For a mini-photo tour of Ardmore, go here.